A new CBD beer is exciting taste buds even as it promotes relaxation. There are few things in life more relaxing than a cold beer after a hard day at work. Now, what if you infuse that beer with the soothing properties of premium CBD? That’s precisely the idea that friends Carl Boon and Thierry Florit had one evening over a few drinks, which ultimately led to the creation of one of the UK’s first CBD beers. 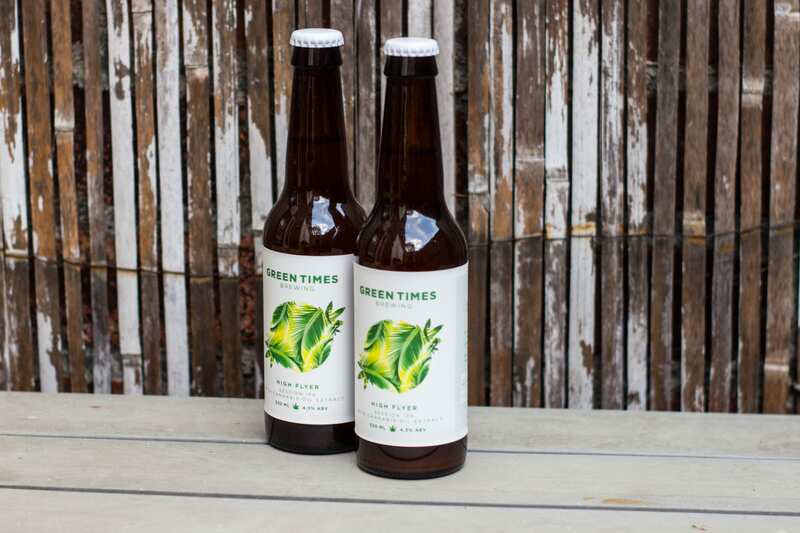 Green Times unique CBD beer combines a delicious light ale with the relaxing power of full spectrum CBD oil. The result is High Flyer: an India pale ale (IPA) craft beer with a 4.3% ABV and containing 10mg of high-quality CBD in each bottle. Its evolution was far from simple. The two business partners overcame numerous development and legal hurdles along the way. Boon runs the successful online CBD company CBDUltra, while Florit is an experienced designer for many major brands. We spoke with them about the long process of turning a booze-soaked idea into a physical product on sale in shops and pubs. “The idea first came about during a late-night beer tasting session when Carl joked about making a craft beer infused with cannabis oil — essentially a drink that adds nutrients back into the body, rather than just taking them away,” Florit told us, with a laugh. Like all good ideas, the duo kept returning to it and soon decided to take it seriously. A few weeks later they set up Green Times Brewing as an official company and sourced a unique water-soluble, full-spectrum CBD. Turning to one of Boon’s colleagues, an award-winning brewer, they then underwent the long, but no doubt enjoyable, process of fine-tuning the formula. As you’d expect, specific details about the CBD beer development process have to remain confidential due to the competitive nature of the market. “We spent a lot of time testing and trialling so we wouldn’t want to give away all of our secrets,” said Boon. When it came to the legal side of things, Boon;’s experience in the CBD industry proved invaluable. “Carl has an excellent knowledge of the regulations regarding the commercialisation of CBD products, though we did have to check with a specialised law firm and all the various UK governmental food and drinks organisations regarding the legalities, to make sure there wouldn’t be any issues when going to market,” Florit said. This includes ensuring the product contains less than 0.2 percent THC and emphasising on the label that “It won’t get you ‘high’”. Brief initial setbacks led the team behind “High Flyer,” a unique CBD beer, to develop a better product including a fully organic formula. Ironically, considering the stringent restrictions on CBD and cannabis-derived products in UK, the main legal issue came from a very different source. “We had a problem with the original name, Cloud Nine Brewing. Just as it was ready to go to market it was blocked because it was similar to a wine company in New Zealand,” said Florit. However, UK laws do have an impact on how CBD is marketed, meaning Boon and Florit have to be careful what they say when promoting the beer. Anecdotal reports tell a different story, and one that might appeal to those keen to avoid the dreaded morning-after-the-night-before. Indeed, these customers may include some famous names considering some of the clients who buy from CBDultra. The pair have big plans for the future. Following a November launch in Manchester, they have many stockists lined up across the country and deal with constant requests from a public who are becoming more educated about CBD, and keen to try it in all its forms. The success of the UK’s first CBD beer is likely to lead to more CBD-infused brews in the near future. Expanding the range seems likely too. Certainly in the UK, beer is up there as our national drink, alongside tea (which you can also find at CBDultra). That explains the excitement around this brew in both the British press and among the public. After tasting the beer — it’s a delicious light ale, with a satisfying kick from the sativa-derived terpenes — it’s hard to disagree. And considering both beer and CBD are two of the world’s oldest relaxation tools, the only question is why hasn’t this combination happened before? Thanks to two friends sharing a few drinks and sparking an idea, now we know how tasty CBD beer can be. The post Is CBD Beer The Ultimate Way To Relax? Behind The Groundbreaking UK CBD Beer appeared first on Ministry of Hemp.